Signed with exclusive content on the history behind the novel. From Andrew Taylor, the No.1 bestselling author of The Ashes of London and The Fire Court comes the next book in the phenomenally successful series following James Marwood. London 1667. In the Court of Charles II, it's a dangerous time to be alive - a wrong move could lead to disgrace, exile or death. The discovery of a murder at Clarendon House, the palatial home of one of the highest courtiers in the land, could have catastrophic consequences. Read more about the background and history that lies behind the bestselling James Marwood novels as Andrew Taylor gives an insight into the research that influenced The Ashes of London. After a varied early career including stints as a librarian, teacher, publisher’s editor and (more unusually) boat-builder on his CV, Andrew Taylor has built a reputation as an astute and accomplished writer. A favourite with Waterstones' customers for his popular series including the Lydmouth novels and the popular Fallen Angel trilogy Taylor is perhaps best-known for his historical fiction, particularly The American Boy, The Anatomy of Ghosts, Bleeding Heart Square and The Silent Boy. The Ashes of London and The Fire Court make up the James Marwood series of historical novels. From the best selling author of “Ashes of London “ and “ The Fire Court” , comes the next book in following the adventures of James Marwood. 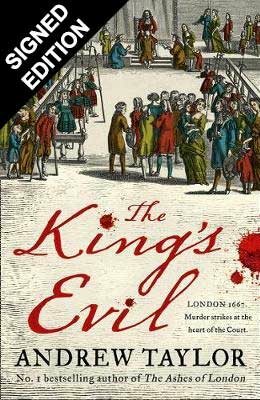 My thanks to Harper Collins U.K. for an eARC via NetGalley of Andrew Taylor’s ‘The King’s Evil’ in exchange for an honest review.